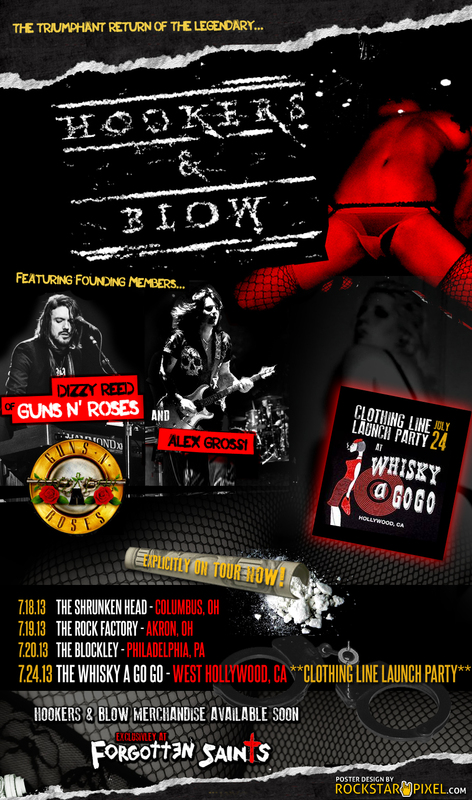 Hookers & Blow, the band led by Guns N’ Roses keyboardist Dizzy Reed has announced a string of July dates including a Hollywood launch party for their new clothing line at the legendary Whisky A Go Go on Wednesday, July 24th. Also performing will be A.L.I.V.E.! — An all-star tribute to 70s era KISS, featuring Rex Brown (Pantera, Kill Devil Hill), Ron Bumblefoot” Thal (Guns N’ Roses), Brian Tichy (Whitesnake, Foriegner) and Mark Zavon (Kill Devil Hill). Hookers & Blow recently completed a four show residency at The Whisky with guest musicians that included members of Marilyn Manson, The Cult, Quiet Riot, W.A.S.P., Ignite, Ace Frehley and more. The band is currently solidifying a fall Hollywood residency which will be will announced in the coming weeks. For more information, please visit the Hookers & Blow Facebook. ‹ 7/13: TRAMP, BSR, CLUTCH, JAKE E LEE, APPEARANCES, TMS, MORE. Dizzy Reed…GNR member, the way Geoff Nichols was a member of Sabbath.